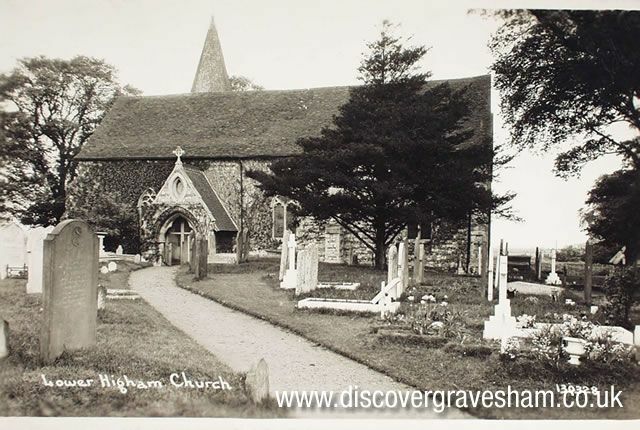 There was a church on the site of the current parish church of St Mary the Virgin at Higham mentioned in the Domesday Book, where Higham is granted to Odo, Bishop of Bayeux. Little of this church can be seen now. The north aisle is the oldest part of the church with a Norman window with its characteristic rounded arch at the west end of the north wall. In 1148 Princess Mary, daughter of Kind Stephen, was granted the manor of Lillechurch in order to build a Benedictine nunnery. It was opened in 1151 and Princess Mary became the first abbess. The abbey was dissolved in 1521. Because of its age and its connections with the abbey, there are many interesting antiquities inside the church. The church door is one of the finest examples of 15th century woodcarving in the country as is the rood screen. The font is Norman. The stained glass windows in the church are interesting for the family associations they have. More detail about the church can be found in ‘A Mosaic History of Higham’ by Andrew Rootes and Ian Craig available at Gravesend Library.